Net Entertainment has again come up with a brand new slot game with a unique theme. The name “Lost Island” is justified by an abandoned place which was once inhabited by certain tribes. They have now travelled in boats to other lands. However, they did not take with them their artefacts and treasures. The main aim of the game is to spin the reels and find out treasures that they have abandoned. The Lost Island slot can be played with just 5 reels along with 20 paylines. Behind these reels, you will witness the backdrop that has varied coloured plants and flowers. Also, some old collapsed houses and other structures can be seen. The first step is regulating the bet. The size of the coin is modified by the “Coin Value” option and it ranges from 0.01p to £0.5. The next step is pressing “Spin” and also you can go for the “Autoplay” option for a relaxed gameplay. For the main high-value symbols, there is a triangular stone, a green drum, a round mask, a golden artefact and a gem necklace. The low-paying symbols are shown by the usual playing card values- 10, J, Q, K and A. A glowing purple flower can also be spotted which is the wild symbol. This symbol can help form winning combos by replacing all the other symbols but the scatter. The wild also gives an addition to the multiplier and this can be spotted on the chart present above the reels. A golden turtle is seen which has a multi-coloured gem in the middle. This activates the main feature. Free Spins – To trigger this feature, the turtle scatter has to be landed. On landing 3 or more scatters, you can avail the benefits of this feature. You can now get ten free spins in this round. A wild symbol is placed in the middle on the third reel. During this feature, the wilds appear stacked on the reels. They seem to be on top of each other. More opportunities for getting winning combinations are made possible in this feature. 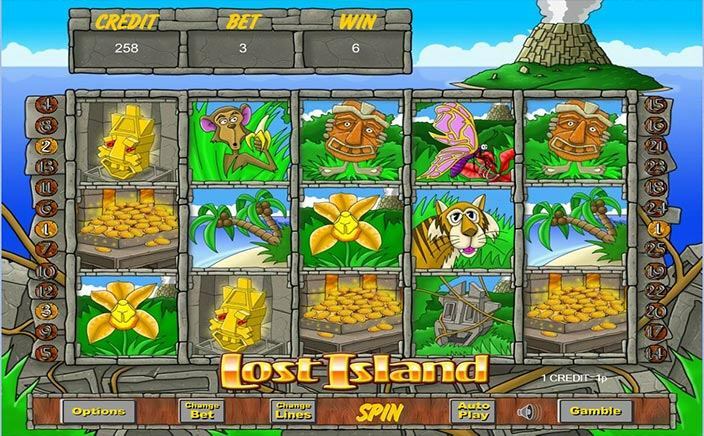 The Lost Island slot is a pretty simple slot game with just one bonus feature. Though there is only one of it, it can significantly increase your payouts. 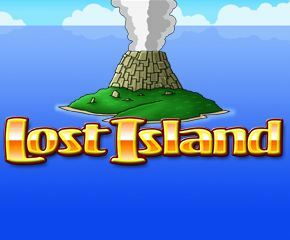 The soundtrack and the graphics quality of the Lost Island is well done and enhance the quality of the gameplay.